2019 Spring CERT training classes schedule starts on April 9, 2019. 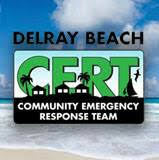 Under the direction of Firefighter Paramedic Kenneth Thompson Community Emergency Response Team Instructor/ Coordinator the following is the newly revised schedule of CERT training classes offered in 2019 by the City of Delray Beach Fire Rescue Department. Classes are held from 6:00 pm until 9:00 pm in rooms A/B/C on the second floor of the Delray Beach Fire Department Headquarters, 501 West Atlantic Ave., Delray Beach FL, 33444. Participants must pre-register by contacting CERT Program Assistant Lillian Gallego or RB Co-Incident Commander, Van Kushner . Or by calling Lillian at (561) 243-7400. This course consists of 24 hours of training one night a week for eight weeks. 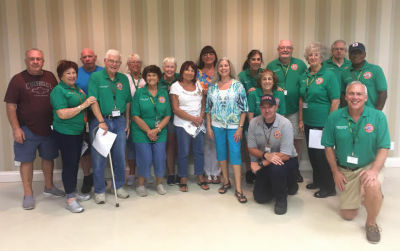 Classes are taught by trained Professional Firefighters and Paramedics from the City of Delray Beach. Course review, content and scheduling. Introduction to disasters, Meteorology 101, impact of disasters on infrastructures. Identifying and reducing potential fire hazards, fire extinguisher use, fire suppression strategy, firefighting resources, firefighting techniques. Treatment strategies for life threatening conditions and principles of triage. Basic First Aid, Head to Toe assessments, treatment for head wounds, treatment for fractures, sprains, burns and other injuries. Search / Rescue priorities and resources, rescuer safety. Techniques for size-up and search. Cribbing and removing lightly trapped victims. The post-disaster emotional environment. The Incident Command System, CERT strategies, tactics and documentation. Define Terrorism; identify actions to take before, during and following a suspected terrorist incident. Emergency communications and procedures. Taking stock before hurricane season. help during and after emergencies. Replace missing or smaller numbers. Don't wait for an approaching storm to buy batteries. Have large plastic bags on hand to store essential documents. ​​FOR YOUR SAFETY: Joe Duffy is the person who comes and installs the new smoke detectors. 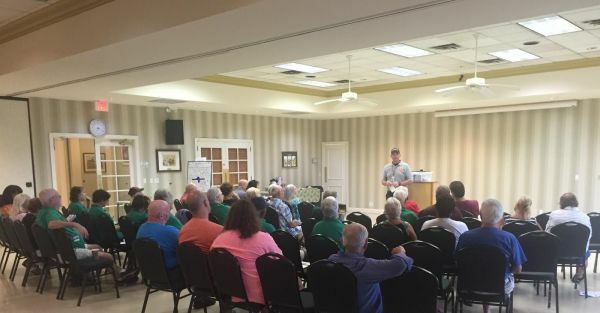 He thanked Rainberry Bay for supporting this program that allows our residents (and Delray Beach ) have new smoke detectors installed free of charge. The newer ones have 10 year batteries. Joe's direct number is: 561-243-7407. He will answer or return your call when he is available. He will even come if you are unable to change the batteries yourself. He does not remove the old hard-wired smoke detectors. Locate and keep a copy of your power bill with you. Call your local emergency management office if you or anyone you know has special needs in case of evacuation. Install an approved hurricane shutter system over windows and doors. Emergency operations officials urge residents to prepare to be self-sufficient for up to 14 days. Keep a battery-operated radio with you and a two-week supply of fresh batteries. Also stock up on: non-perishable food, medications, baby supplies, pet food and bottled water — the American Red Cross recommends one gallon of water per person per day. Check emergency equipment: flashlights, battery-operated radios and extension cords. When working on a ladder, look up and note the location of power lines. Be sure that ladders or scaffolds are far enough away so that you — and the tools you're using — don't come within 10 feet of power lines. Do not travel or venture in the dark until it is safe to do so. Stay away from standing water and debris, which could potentially conceal a live wire. Watch for downed power lines and do not attempt to touch them. Call 911 or your power company (FPL customers, call 800-4OUTAGE) to report fallen power lines. Never run generators inside your home or garage, as they produce potentially deadly carbon-monoxide fumes. Keep generators away from all open windows to prevent deadly exhaust from entering a home or business. Buy a battery-operated carbon-monoxide alarm, which will alert you if carbon-monoxide levels become dangerous. Always thoroughly read the manufacturer's instructions to ensure the safe operation of your generator. For more tips on how to stay safe and prepare for 2016 storm season, visit www.FPL.com/storm .